I’ve mentioned before how rubbish the weather in the UK can be, so this will be no shock. But this Winter, it’s actually been fairly mild compared to previous years – but with the mild weather and lack of snow has come a LOT of rain. Plus it’s hardly been warm, just less-freezing than the last couple of winters. In line with the rubbish weather, I’ve picked out a trio of products I’ve been reaching for as my winter skin savers this season. So anyone else with chapped lips/dry hands can have a little bit of help too. Elizabeth Arden Eight Hour Cream* (£25) – one with a pretty legendary cult status, you might be surprised to know this is my first time using the original version. Yes, really. I’ve used a version with SPF 50 in a few years back, but not touched the original. And whilst it’s not the choice for all (some find it too heavy and aren’t keen on the ingredients) I’ve found it to be really great for my hands and cuticles. I don’t think I’d use it on my face (perhaps my lips for a quick fix) but for my hands, which are eternally dry, no matter what I seem to do for them – this has been really soothing and hydrating. A little goes a long way with this, so not one to coat your hands in, unless you want to leave handprint marks wherever you touch. But as a winter skin saver, this is working for me. Blistex Intensive Moisturiser (£2.63) – This is another one I’ve been loving as a winter skin saver, and one I’ve used on and off for years. Generally coming back each time my lips get chapped in the winter. This was my essential post NYC, where my lips were sore and cracked from cold weather, snow and long flights. This for me is a bit of a wonder product, as I find something like two or three applications is enough to rescue my lips from dry, sore and cracking – to their normal state. Definitely a winter essential. There are my trio of Winter skin savers…what are yours? The Ren sounds interesting…I haven’t seen this offering before…. 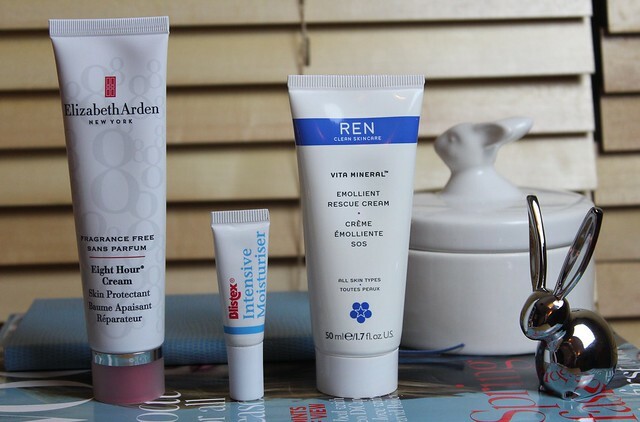 I love the sound of the Ren rescue cream, I’m always looking for good hand creams! My winter skin essentials definitely have to include the Origins Night a Mins high potency night cream, it is such a treat for dry chapped skin. I love the 8 hour cream! The skin under my eyes have been really itchy and dry- all those late nights/heating/weather and the only thing to help the skin was the 8 hour cream… It is really greasy and thick on the face, but worked a charm! Yes to the Elizabeth Aren 8 Hour Cream – I love this stuff & have a sample size in my handbag. I use the 8 Hour Cream on my face and lips all the time. Sometimes, I use it all over my face as an overnight treatment if my skin is super dry (be sure to sleep on a towel though because otherwise your pillowcase will be gross), and other times, I just use it as a highlighter on my cheekbones. It is the perfect product to give your skin the “internal glow” look if you’re not wearing much makeup. I love the Eight Hour cream for my lips. I keep meaning to try REN products, maybe this will give me the push to take the plunge! I also like Steam cream and Palmers cocoa butter..
Fab selection of products! We hear lots of lovely things about REN, their ethos and quality speaks volumes. Eight hour cream is essential for the winter months, it’s an amazing product!